Age Ain’t Nothing But A Number | Runner. Writer. Renegade. After I posted about my first spectator and racing experiences at the Boston Marathon, my friend Heather — with whom I ran Boston the first time — noted I omitted one of the highlights of the trip: watching the Olympic Trials. She’s right, of course, but it didn’t fit the arc of the story. And the column was destined for print in The Running Journal, and I suspect my editor had to work some magic to squeeze in the 900 words I sent him. But, I now have the perfect opportunity to reminisce, as the victor of those trials just set a new American master’s record in the marathon. In 2008, the women’s and men’s marathon Olympic Trials were held separately, in Boston and New York on the day preceding those cities’ major marathons. While more recent marathon trials have had both genders concurrently, they’ve stuck with having the race before a major marathon (although not one of the Majors series marathon since 2008). And, a “crit course” has become the norm, usually 3-4 loops on a 6 or 8 mile course. In Boston, that meant a big loop downtown, across into Cambridge, around and back; repeat. My friend Heather, her dad and myself found a place where we could see the runners several times. I am not far behind her right shoulder! And Deena Kastor, a runner I have always admired, won. Better yet, I got a high five from her after she was draped with the American flag. Unfortunately, Deena would drop out of the marathon at the 2008 Beijing Olympics due to a broken foot. Later, it was revealed that the break likely stemmed from a vitamin D deficiency — she had adequate amounts of calcium but her body couldn’t absorb it. The vitamin D deficiency was caused by her concerted efforts to limit sun exposure through sunscreen, long sleeve shirts and hats after battling melanoma. When Deena won the Olympic Trials that year, she was 35. In recent years, a number of elite women have raced well in their early 30s — in fact, the second and third place finishers that year were 34 (Magdalena Lewy Boulet) and 32 (Blake Russell). Even Kara Goucher is now 37. 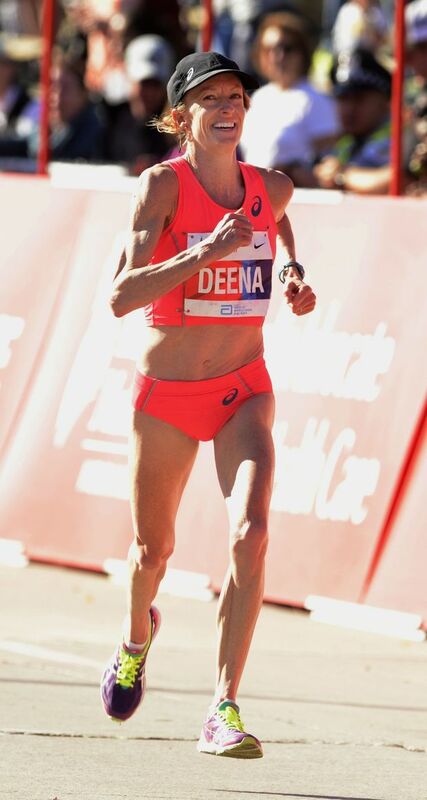 Last weekend, Deena broke the U.S. Master’s Record in Chicago, running 2:27:47 — 5:38 per mile. She broke the 10-year-old record by nearly a minute. She was also the top American female finisher. 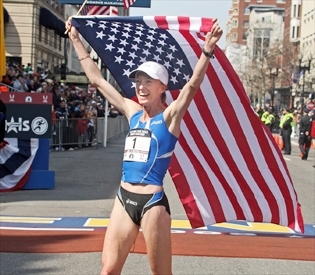 With her performance (in Chicago) — her first sub 2:30 marathon in six years — Kastor returns to conversation for the U.S. 2016 Olympic marathon team. The time she ran currently puts her fourth on the list of U.S. women who have qualified for the Olympic Marathon Trials, behind Shalane Flanagan, Desiree Linden, and Amy Cragg. A study published last year found that women tend to peak at the marathon at age 29, two years later than men do. Of course, that’s subject to your own training and your body — and I’m hoping I’m more of a Deena! Or a Shannon Knabel – my friend who is setting PRs in her mid-40s despite having been a collegiate runner. Also, here’s a cool article from a couple of years ago comparing the ages, genders and finishing times from Chicago, New York and Marine Corps that I came across while writing this post. ← Week 8 Recap — Winner, Winner, Chicken Dinner!